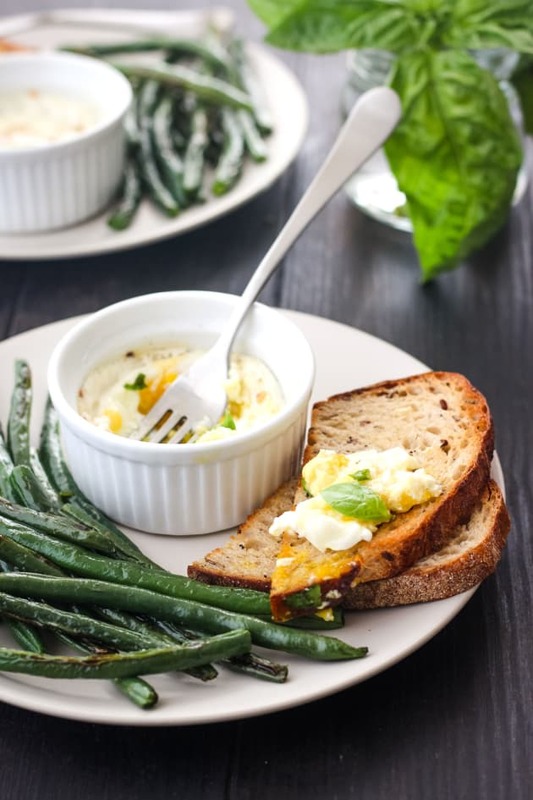 Dreamy cream baked eggs, crisp-yet-tender roasted green beans, and toast for dipping - I’d happily eat this baked eggs and green beans dish every day. Based on how much you guys enjoy a good toaster oven frittata, I’ve got a feeling you’re going to love it too. 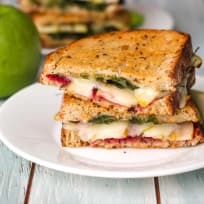 Over the holidays and during a very busy January, we’ve had this recipe on repeat for weekend breakfasts and even a few light lunches. 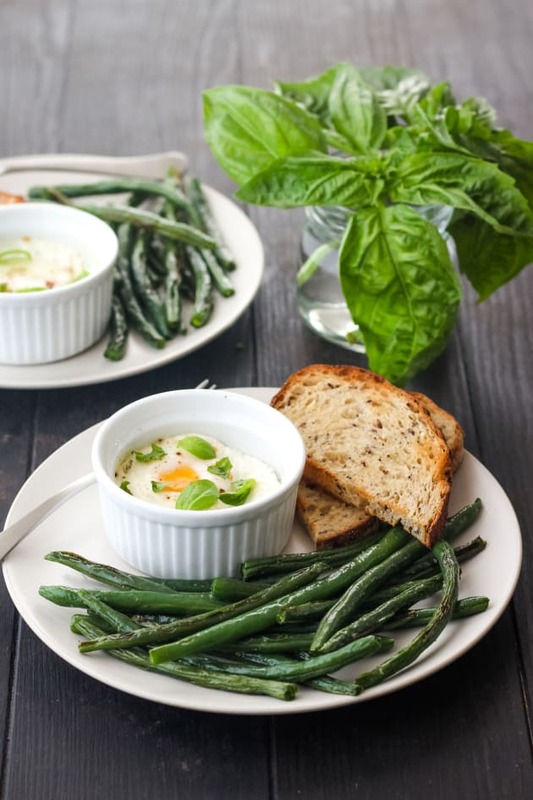 If you want to mix things up, try swapping the green beans for sweet bell pepper slices or broccoli, both taste great with eggs. 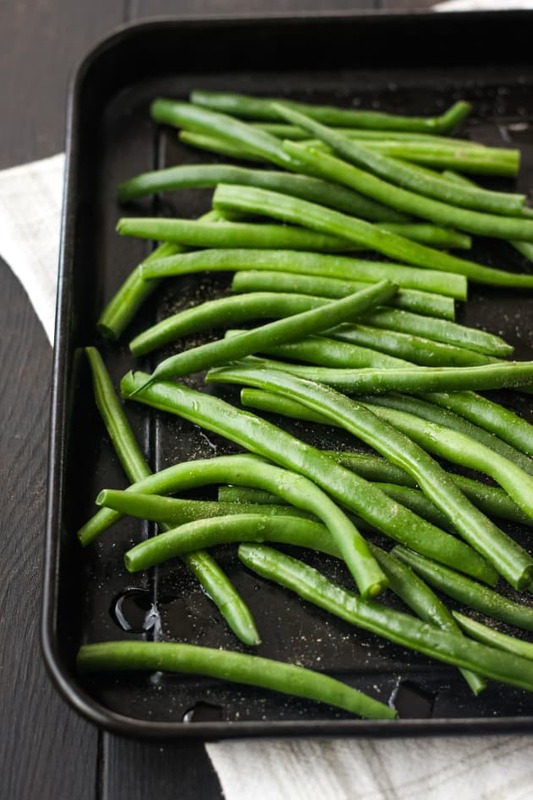 Fresh Green Beans: if you want to make things super easy - snag a bag of precut, washed, and ready-to-cook beans. Half and Half: your eggs will have a seductive creamy texture courtesy of this stuff. Cheese: vegetarian parmesan is the #1 pick in our house but crumbled feta tastes great too. Eggs: cold, straight from the fridge is fine. Fresh Herbs: not required, but a nice touch. 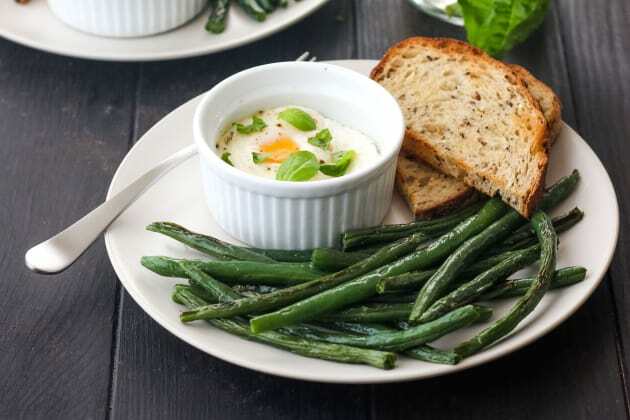 Bread: because what good is a jammy yolk if you don’t have toast to dip in it? 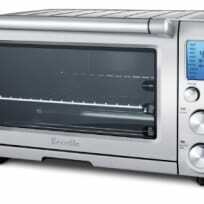 Start by preheating your toaster oven to 425°F and grabbing a toaster oven-sized pan. I usually reach for the roasting pan that came with our Breville. It helps the beans get those dark roasted spots that always taste so good. Next, trim the ends of your green beans. Place them on the pan and drizzle (lightly) with oil. Salt and pepper applied with a heavy hand is always a winner. Everything Bagel Seasoning is also delicious though it does come with a side of garlic breath. Now, scooch those beans to one side of the pan. Spray two 3-ounce ramekins with oil and place them on the other side. Divide the half and half (or heavy cream if you’re feeling indulgent) and your cheese of choice between the ramekins. Sprinkle with salt, pepper and, red pepper flakes if you like a spicy kick with your eggs. Now, crack an egg into each one. Bake for about 6 minutes, then carefully remove the pan so you can add the bread to toast. If you’ve got a second rack in your toaster oven you can just leave the pan where it is and add the bread there. We’ve only got one rack so I prop our bread on the sides of the pan. This way it doesn’t cover the beans and cause them to steam instead of roast. Full disclosure: the bread won’t get super browned but it does get toasty. 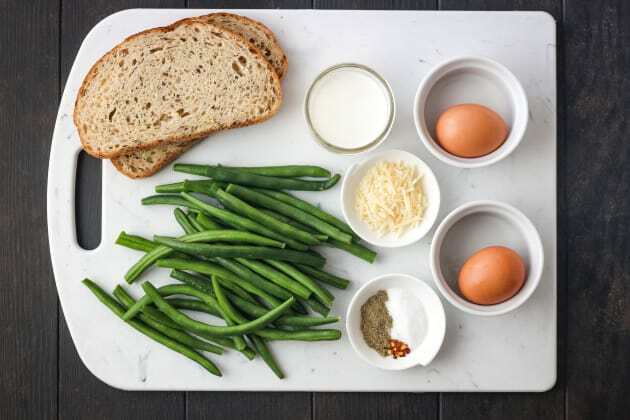 If you’re picky about your toast, just make it before you cook the eggs and beans. 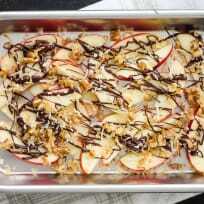 Now, pop the pan back into your toaster oven to cook a bit longer, about 6 to 7 minutes more. Just like with these baked egg tostadas and bell pepper baked eggs, you’re looking for the whites to be set with the yolks cooked to your liking. Jammy yolks (for dipping toast in) are my preference but if you like a hard yolk cook the eggs a few minutes longer. Lastly, sprinkle on some fresh basil or chopped parsley and dig in! Adjust cooking rack to the bottom position and preheat the toaster oven to 425°F. While the toaster oven preheats trim the ends of the green beans. Combine the beans and oil on a baking sheet and season with salt and pepper. 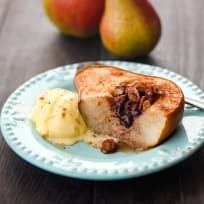 On the same baking sheet add two lightly oiled 3-ounce ramekins. Add 1 tablespoon half and half and 2 teaspoons cheese to each ramekin. 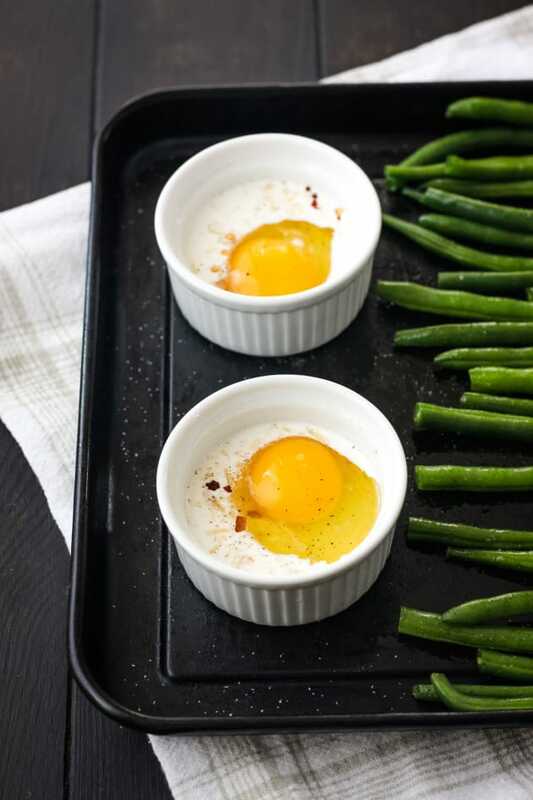 Crack an egg into each ramekin and season with salt and pepper. Place pan in the toaster oven and cook for 6 minutes. After 6 minutes, carefully remove the pan and stir the beans. Place bread slices on the edge of the pan and return to the toaster oven. 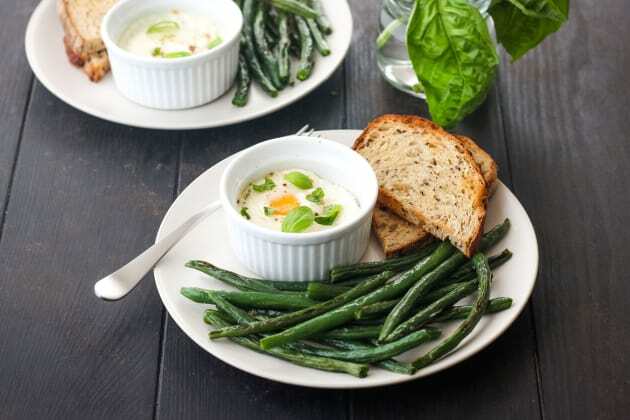 Continue cooking until the whites of the eggs are set and the beans are a little wrinkled but still crisp-tender, about 6 to 7 minutes more. 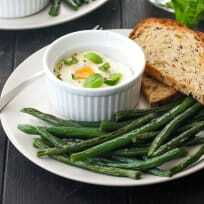 Top eggs with fresh herbs and serve warm.